This page is the home page of the Bellbird Corner Riverside Reserve Management Committee. Four kilometres northwest of Maffra township, is a spot on the Macalister River at its junction with Newry Creek, named Bellbird Corner. I first got to know it in 1944, when I came to the district to live, and rode my bike past Bellbird every day on the way to school. 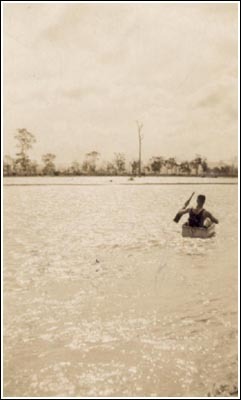 In those days the river was pretty much in pristine condition, with clear water, Platypus, eels lying beside the logs, beds of freshwater mussels, freshwater crayfish, and good populations of Blackfish and Tupong, or sand trout, as they were known. The riverside vegetation of Forest Red Gum, Silver Wattle, Blackwood, and under shrubs of Woolly Tea Tree, River Bottlebrush, Tree Violet etc. was a real wilderness, and in the trees was a longstanding colony of Bell Miners, hence the name. At this time, the Tuan, or Brush-tailed Phascogale, lived along the Macalister, and we used to see one occasionally on the farm when it came looking for a meal. Newry Creek was also a fertile waterway, full of shrimp and other invertebrates, eels, and Eastern Snake-necked Turtles. Once I saw a large school of Golden Carp lying close to the surface. The Water Rat also made its home along the creek. Even though the land was used for dairying, the numerous waterholes or billabongs held sweet water, and were much favoured by the tortoises, as we called them then, and we often used to find their nests of eggs close by. I still remember the little birds pottering round the edges, birds which I now realize were Black-fronted Dotterels. The paddocks along the creek were favoured by Latham's Snipe, and Whistling Kites patrolled overhead. In conversation with Alan Vance of Maffra, who lived much of his life adjacent to Bellbird, I learned that in the early thirties, two aborigines often used to camp on the river at Bellbird. One was named Pepper, a surname that figures prominently in the history of Ramahyuck Mission, which was situated in the Lake Wellington area. He was probably a descendant of Nathanael Pepper, who was however, a Lake Hindmarsh man, who followed Dr Hagenauer to Ramahyuck from the Wimmera in 1869. Whether the other man was a local would be impossible to establish. It is certain that members of the Kurnai people frequented this section of the river, as a canoe tree used to stand on the Vance property, and a stone axe was found on my uncle's property. It is well known that aboriginal people liked to camp at the confluence of streams, and the junction of Newry Creek and the Macalister would have been an ideal camp site, with shelter and abundant food. On a farm close to Bellbird Corner lies an unmarked grave, where a two year old girl, Eliza Amey rests. The little girl drowned in a waterhole near the dairy in 1865, and was buried on a rise beside a lagoon, in a coffin made of two sheets of bark from a big redgum tree. The grave used to be enclosed by a morticed post and rail fence, but this has disappeared with the passing of time. The "coffin tree" is still clinging to life, and a picture showing the scars has been added to the gallery. Eliza's burial has now been located by ground penetrating radar, the grave has been enclosed by a low railing and a headstone with bronze plaque has been installed. To visit Eliza's grave, turn on to the Lower Newry Road from the Maffra-Newry Road, and you will see it on the right 70 metres from the corner. 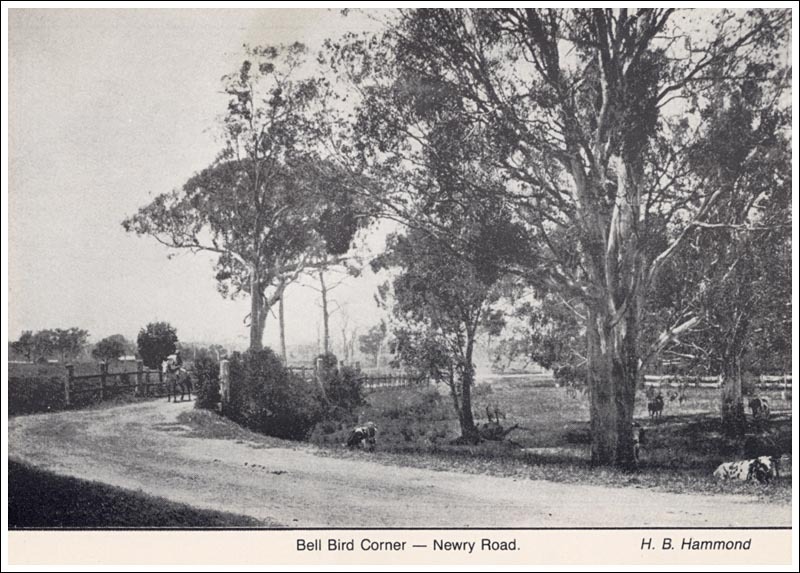 Below is a picture of the road into Maffra, taken in the early twenties by H B Hammond, a local photographer, from a position beside the bridge over the Newry Creek at Bellbird Corner. The big tree in the left background is a Manna Gum, E viminalis, and it is still there today. It looks as if it has been struck by lightning, and the upper trunk is dead, but the bark is gradually covering it, as the old tree repairs the damage. I recently took a camera and framed up the picture as near to the original as possible. You will see that the second bridge is gone, in fact only one of the four along the river remains, and that is derelict. The big Manna Gum is hidden by new trees, and the road appears to have been built up. At the lower left, the old house is visible above the bridge railing, while in the new shot the new house can just be seen between the two Red Gums. The road has been closed for many years, since a new road above flood level was built over Pine Hill. The property on the left of the road belonged to Fred Vance, and was bought by the Guy family, of Crooked River fame, about 1940. It is now run by the late Arthur Guy's daughter, Cath. Noble. The Macalister still used to flood regularly until the wall at Lake Glenmaggie was raised in 1957. The picture at right shows the top end of my uncle's farm at Bellbird under water at some time in the thirties. When a big flood came, he used to drive his cows along the road to his bush paddock just north of Maffra. These floods were the lifeblood of Newry Creek, and all the waterholes, and in the distant past built up the heavy fertile soil on the flats. Since those earlier times, The Macalister, Newry Creek, and Bellbird Corner have deteriorated sadly, due to a number of factors, such as decreased river flow, removal of streamside vegetation, more intensive land use, and that scourge of our waterways, the European carp. The Bellbird colony moved on long ago, but the name remains to remind us of what used to be. 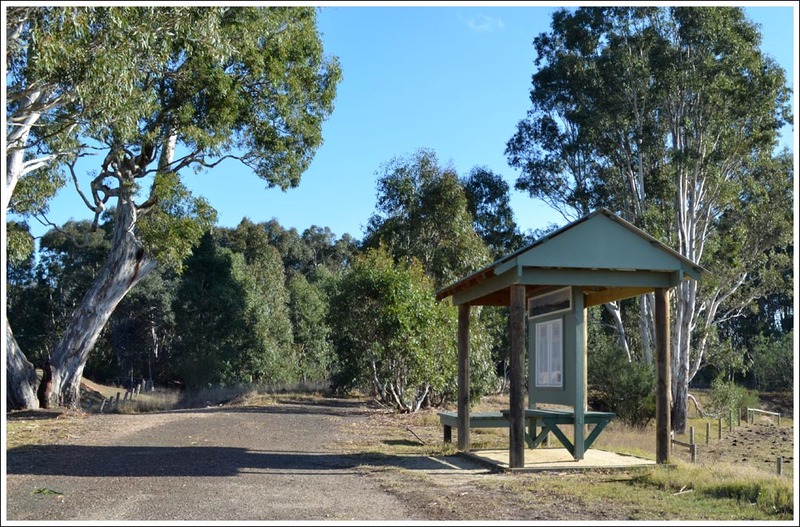 However, a new lease of life for the area is beginning, it is now managed by a local committee, the Bellbird Corner Riverside Reserve Management Committee. It is fenced off from neighbouring farmland, and major willow eradication works have been carried out along the river by the West Gippsland Catchment Management Authority. Replanting the banks with native species started on Saturday 19th. May 2001, with the Newry Macalister Landcare Group, and Young Farmers involved. The resulting improved habitat should draw in more native bird species to add to the already respectable list. As the hundreds of new trees and shrubs grow, it will be interesting to see what new birds come in to stay for a while. The latest addition to the list is Tawny Frogmouth. Since the cattle were fenced out, there has been significant natural regeneration of Red Gums and Silver Wattle, and a very pleasing development has been the discovery of runways and burrows of Swamp Rats, Rattus lutreolus, in the long grass by the river bank. In addition to Brushtail and Ringtail Possums, records of the Short-beaked Echidna, Water Rat, Platypus, and an Antechinus species have been made. Sugar Glider is another possibility but has not yet been confirmed. Foxes and feral cats are present in the area, and pose a threat to small mammals, control measures will have to be considered. Visitors to Maffra can enjoy a pleasant walk and good birding at Bellbird Corner. Follow the Newry road for about two kilometres to the crossroads at Sandy Creek, and turn left. The gate and signs are a short distance down this road. Easy walking tracks follow the river and creek through to the Lower Newry Road. At times the bridge over the Newry Creek is under water and impassable. The photo gallery will give you an idea of what to expect. 15/01/2013 As the result of a Landcare Twenty Fifth Anniversary grant, another area has been cleaned up and re-vegetated with one hundred and sixty indigenous trees and shrubs, and an information shelter with seating and signage will tell the story of the reserve and its flora and fauna. The planting survived a metre of flood water rushing over, the stakes and guards held up well and the soaking of the ground gave the plants a good start. 27/12/2012 A platypus was sighted for ten seconds by Mr. C Reynolds at the confluence of the creek and river. 20/11/2010 Another successful canoe event organised by Nicole Russell of the WGCMA took place, starting from Bellbird Corner. 22/02/2010 The committee has purchased a John Deere ride on mower for the maintenance of the reserve. other equipment purchased includes a whipper snipper, a fifty litre spray unit and two hand sprayers. 20/10/2009 A platypus was seen by two birders at the bend just downstream of the picnic area, it came briefly to the surface of the swollen river. 13/7/2009 On the bird front, a male Red-capped Robin was at the reserve for several days. This species is an uncommon visitor from north of the divide. 10/6/2009 Eliza's grave has now been enclosed by a low railing, and a headstone has been put in place. The vandalised plaque on the rock outside the fence has been replaced by a new one of bronze. 18/8/2008 Bellbird Corner experienced two huge floods, in July and November 2007. A large amount of flood rubbish was left behind, but nature has taken care of it and there's now little to be seen. Although much of our planting was under the rushing water, it survived remarkably well and we had few losses. The redgums on the reserve that had been showing signs of stress due the continuing dry conditions gained a new lease of life and are now looking great. The July flood took several sections of river bank, the WGCMA rocked the one at the river bend, and we have planted suitable shrubs in the others to bind the bank against further damage. The November flood took the lower picnic table, and the bridge over the Newry Creek. We found the table and reinstated it at a higher level, but no sign was found of the bridge or the tree to which it was fastened. Thanks to flood recovery money from the DSE, we were able to purchase the materials for a new bridge and it is now in place just down stream from the site of the original. We also lost the safety fence at the Craig's Monument bridge, but again thanks to flood relief money it was retrieved and reinstated. 10/8/2007 The Wellington Shire through Martin Norris have arranged for ground penetrating radar to scan the site of Eliza Amey's burial, and the good news is that the outlines of the bark coffin and Eliza's body were discovered in the exact position mentioned in the old records. We can now start to organise proper marking of the grave. 22/04/07 Today after much preparation we had a public gathering to unveil plaques at Eliza Amey's grave site, and the coffin tree. About one hundred and fifty people were in attendance, including many members of the family. A barbecue was enjoyed in the Newry side of the reserve, where Councillor Peter Gault representing the Wellington Shire gave a speech of welcome and appreciation. Anne Napier spoke at the grave and tree on their heritage values, and local historian and family member Flo Pearce also gave a short speech. Tony LaRosa who now owns the old Amey farm, and his tenant Mary Hardwick kindly arranged for the homestead to be opened for inspection. Afternoon tea was served on the verandah, where Ann Napier had the Lone Graves exhibition on display. The committee wishes to thank all who helped, with a special mention to Phil Taylor of the WGCMA who transported the grave site rock in from the quarry and placed it in position. Thanks also the Wellington Shire for the plaques and fencing of the coffin tree. 24/10/2006 Greg Gilbert of Waterwatch ran the Macalister Canoe Event down the river from Bellbird to Maffra this morning. There were speakers along the way covering a variety of subjects affecting the river. Gavin O'Shannasy sent the canoes off from the picnic ground with a terrific fanfare from his didgeridu, great sound Gavin. 21/12/2005 The big news is that a Platypus has been seen at Bellbird Corner, something we have been waiting for since we took over the management of the reserve. It was sighted at the Maffra end, coincidentally, where we thought this special mammal would be most likely to show up. Thanks to Daryl for the information. 3/9/2005 At today's working bee the gully was planted with a teatree, Leptospermum obovatum, with the aim of introducing nesting habitat for smaller species of bird. The river was running a banker and starting to flow into the planting site, hopefully they will be OK! 6/8/2005 At the working bee today a new track was cut along the river from the picnic ground to the Newry Creek junction. There is now walking access to the river throughout the Reserve. 2/7/2005 The planting went off well this morning, a crew of 11 started planting at 10 am and we had 175 plants in, watered, and guarded by noon. 29/6/2005 Unfortunately the June planting was cancelled due to inclement weather, but it will now take place on Saturday July 2nd starting at 10 AM. Everyone welcome to attend and help. 30/5/2005 The next planting will take place in June. The two banks adjoining the picnic table will be planted out with Manna Gums and several understory species by St Mary's students and volunteers. The banks have been cleared and preparations will be made on Saturday morning, 4th June, from 10 am. 4/12/2004 A Gippsland Water Dragon has been seen by several people at the bridge over the Newry Creek, These large lizards are not uncommon along the upper Macalister and Avon Rivers and tributaries, and it is great that Bellbird Corner is now home to one. Hopefully it won't be the only one we see in the Reserve. A working bee today started this season's weed spraying program. The committee would appreciate help with the maintenance program, anyone interested in lending a hand would be very welcome, please ring 51471671. 13/10/2004 On the Newry side of the creek we have repositioned the bridge pile to form a seat beside the track to the bridge. The Wombat Trail has been extended, and there is additional signage to the trail and the creek crossing. 21/8/2004 Spring is already underway, the Silver Wattles and Tree Violet are in flower, filling the air with perfume, and birds are nesting. The George Gray Centre has become actively involved with Bellbird Corner, with a group of clients led by supervisor Gary Pleming visiting periodically to do some mowing, and to enjoy spending time in the riverside environment. Increasing numbers of the public are also enjoying bird watching and walking through this beautiful natural area. A crew of community service workers have done a good day's work cleaning up and burning fallen tree tops, straightening tree guards, and replanting dead trees. Two more tree plantings have taken place with St Mary's and friends, on June 5th and on National Tree Planting Day, July 25th. All our remaining trees were planted, and now we need some good rain to ensure their survival. The Wombat Trail has been extended and now starts opposite the old bridge. The Committee has been successful in obtaining a federal grant to purchase a slasher and string trimmer, which will be a big boost for our maintenance efforts in the Reserve. 23/5/2004 St Mary's school held a tree planting day, and about 500 Red Gums and understory plants went into the ground. Just over a day later 9.5 mm of rain fell to give them a good start. 17/5/2004 The picnic table is finished, and the track and steps leading to the bridge are finished. 27/4/2004 Good rain has fallen and the tree planting will take place on the 23rd May. Newry Creek flooded and gave the bridge its first test which it passed! 20/4/2004 A new walking track along the river, The Wombat Trail, has been cleared between the two picnic areas and is a very pleasant walk. As the name implies it follows a beaten track made by wombats moving along the river. A low level bridge over the Newry Creek has been put in place, linking the two halves of the Reserve. Thompson Treated Timbers of Maffra generously donated half the bridge planks. Some work to form steps still remains and will be carried out soon. A picnic table will also be installed at the Bellbird Picnic Area by the Newry Lions Club. 25/3/2004 The tracks and picnic areas have been mown ready for use, and a low level bridge over the Newry Creek will be built soon to link the two sections of the park. Some welcome news, a Water Rat has been seen swimming across the river confirming that the species still inhabits the river system. St. Mary's school plans to plant 1200 trees in mid May if we get enough rainfall to moisten the soil. 27/11/2003 The old farm roller has been restored and relocated to the Reserve entrance at the Maffra end. The Committee is at present pursuing grants to erect the bridge over the Newry Creek, and to form a smooth gravelled pathway through the Reserve. More fencing to protect vegetation is also on the drawing board. 10/10/2003 At the Lake Wellington Network Landcare awards night at Morwell, Bellbird Corner won the Nature Conservation category, a very pleasing achievement for all involved in the restoration of this special area. 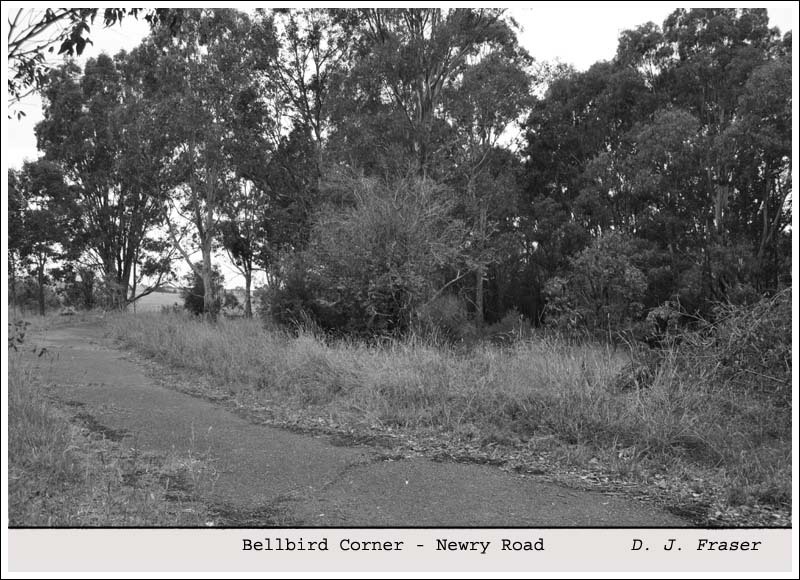 30/9/2003 The first meeting of the new nine member committee took place, and Bellbird Corner is entering the next phase of its restoration and development. Volunteers and helpers will be very welcome, and can contact the committee via the email link. September 2003, Lake Glenmaggie is overflowing, and there is a good flow coming down the Macalister. It has run into one of the billabongs at Bellbird, triggering a breeding event for several species of frog, which are calling incessantly. Recognisable by their calls are the Brown Tree Frog, Verreaux's Tree Frog, and the Spotted Marsh Frog. These will go on to a frog list which will be added to as time goes by. 27/7/2003 National Tree day, the students held a successful tree planting on the Newry side of Bellbird Corner, with help from parents, staff, Landcare, Maffra Lions, and committee members. Committee members visited St Mary’s on the to see the projects the students have completed, and were impressed by the amount of work they have put in, and the enthusiasm for Bellbird Corner and its environment displayed by these young people. 24/7/2003 St Mary’s Primary School in Maffra has become involved with Bellbird Corner. After an information session and a visit to the area, a group of students will decide on a project to enhance the area. They will then present their ideas to the committee, and after getting approval, will, with help, put their plan into action. This kind of initiative is just what Bellbird needs, and is welcomed by the committee. The Bellbird Corner visit took place when the pupils accompanied by teachers, parents, and helpers, took part in seed collection, weed surveys, and water quality sampling, saw a few of the elusive birds, learnt a little of the local history, and generally got to know the area. 21/7/2003 At a public meeting four people volunteered to form a new Bellbird Corner committee under the auspices of the Department of Sustainability and Environment. It is hoped that more members will be added. No funding is available however, so future work at Bellbird will be subject to the obtaining of grants or donations. Help from volunteers will crucial in looking after the area. 25/5/2002.Twelve months on, the first plantings have made good growth, due to the great seasons we have had. Some of the Silver Wattles now top eight feet, and the Common Hempbush, six feet, a phenomenal growth rate. On 10th May ’02, the plantation fence along the river was removed, and also the poplars, restoring the natural appearance of the river bank. A large number of Swamp Paperbarks were also planted around the waterhole, in one of the gullies, and beside the river, in the downstream end of the park. Today, the Army engineers inspected the site of the original Bellbird Corner bridge, to examine the feasibility of erecting a suspension bridge over the Newry Creek, which would give uninterrupted access for walkers and cyclists from both ends of the park. To help with the revegetation project, an ongoing botanical survey is being carried out to try to determine as far as possible, which species grew along the river in the past. * Eliza * Bird List. * Mammal List. * Reptile List. * Odonata List. * Plant List.